We own and operate a family farm milking about 250 Jersey cows and cropping about 580 acres. I bought the original 80 acres from my parents in 1980 and now my son, Tim, and I handle most of the work load. We purchased a QPI Posi-Drive from Quality Parts Inc.
As you look at the four factors of production (land, labor, capital, and management) labor is one item that we always strive to reduce per unit of production in order to remain competitive. I've used Harvestore® silos to handle our forage and high moisture corn for the herd, but unloading the units has been challenging at all times. In the 9 sealed units we have used Goliath®, Goliath II®, and Alliance® unloaders as well as an XL® unloader from Harvestore®. Over time I became frustrated at the lack of reliability and the expense of these unloaders and began searching for a better alternative. 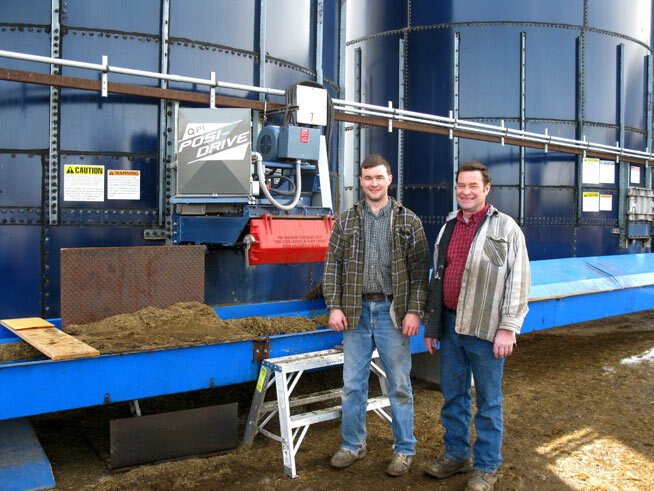 Last year we purchased a QPI Posi-Drive from Les and have found it to be superior to any unloader we've had to date. It has provided good unloading speed, is user friendly, has been trouble free and has been backed by tremendous dealer support. It's our belief we've found quality Products (unloaders and parts) at a fair price. We would like to add more Posi-Drive unloaders in the future. Tim and David Bowers of Rolling Meadows Farm.